Every physician, psychiatrist, or other medical professional who prescribes a medication has certain legal and ethical responsibilities in doing so. One of these duties is to prescribe the correct amount of the correct drug to treat the specific condition. 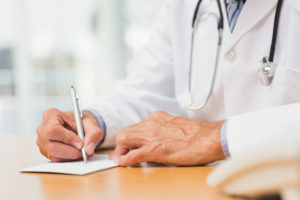 Another responsibility is to warn the patient about any potentially serious side effects associated with the medication.If your medical professional has failed to live up to these responsibilities, please contact us here at Fronzuto Law Group. Our firm’s attorneys hold more than 75 years of experience between them. We can provide you with the intelligent legal guidance you need in order to assess your options and to choose wisely from them. Please schedule a free initial consultation with our prescription negligence lawyers today by calling 973-435-4551 (toll free at 888-409-0816). You may also contact our law firm online. The doctor should monitor the patient’s condition to ensure that he or she is not suffering severe effects from a certain medication. If side effects become apparent, the doctor should immediately take the patient off that drug. The doctor should take action to find a different medication that effectively treats the condition. The doctor should work to correct any physical harm that occurred due to the side effects. If you or someone you know was injured by prescription negligence, you can count on Fronzuto Law Group, Attorneys at Law. Our founder, Ernest P. Fronzuto, has more than 17 years of experience and has been listed in New Jersey Super Lawyers magazine every year since 2006. He is also certified as a Civil Trial Attorney by the Supreme Court of New Jersey.Learn more about how our law firm can be of assistance by contacting our office today: 973-435-4551 (toll free at 888-409-0816). We offer free initial consultations in all medical negligence cases.